As more than one million visitors brave the frigid elements to watch the Times Square ball drop, Carnival Cruise Lines is making a play to get their warm weather destinations top of mind. Carnival today announced it is the official confetti sponsor of the Times Square New Year's Eve 2011 celebration. The deal includes on-site media that will associate the "Fun Ship" brand with Times Square New Years Eve, an online promotion and an exclusive opportunity for employees and business partners to be on stage at One Times Square for the ball drop. Carnival's Senior Cruise Director John Heald will lead the first confetti drop of the New Year's Even 2011 party. At midnight on January 1st, 2011, Carnival Confetti will be hand-tossed by approximately 100 of Carnival's guests, including a number of Carnival employees. Carnival will also run Times Square billboard advertisements and a text to win cruise giveaway on New Year's Eve. "Carnival is thrilled to be part of New York City's New Year's Eve celebration and add our brand of participatory fun to the festivities," said Jim Berra, senior vice president and chief marketing officer for Carnival Cruise Lines. 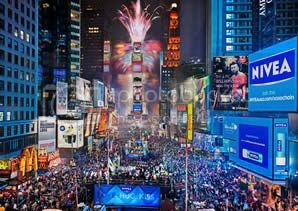 "There is no place more iconic and energetic than Times Square on New Year's Eve, so the opportunity to be the official confetti sponsor of this celebration is a great way for us to reinforce the fun our guests experience and to kick off the New Year for our brand. We'll also be sending warm thoughts of Caribbean climes and tropical breezes to the revelers braving the cold by giving away a Carnival cruise vacation to one lucky person." Carnival is giving people a chance to add their wish to the Carnival Confetti New Year's Eve Wishing Wall at the Times Square Visitor's Center. Wishing Wall visitors are invited to share their hopes for the coming year on colorful slips of paper that will be added to the ton of confetti that will come down when the clock strikes midnight on January 1st. Carnival is integrating Facebook by allowing fans get their wish included in the Carnival Confetti drop by visiting facebook.com/Carnival. Last year's Confetti Sponsor was Papa John's. Here's a look at the 2010 Confetti Test.